PhD, Law School of Renmin University of China (1997). BA, Law, Department of Political Education of NNU (1982). Research Interests: Philosophy of Law; Modernization of Rule of Law. Research Projects: 4 national scientific research projects; 6 provincial and ministerial level scientific research projects. 1.A Brief Comment on Marx's Legal Philosophy Thought, China Social Sciences, 1990 (2). 2.The Globalisation and the Modernization of Chinese Legal System, Jurisprudence Study, 2000 (6). 3.Internationalization and Localization: the Challenge of Times to Modernization of Legal System, Jurisprudence Study, 1997 (1). 4.A Primary Exploration of the Legal Thought in Marx's Anthropology Notes, Jurisprudence Study, 1992 (1). 5.On the Difference Between Law and Legal, Jurisprudence Study, 1987 (4). 6.The Process of Times of the Road of the Rule of Law with Chinese Characteristics and Socialist Orientation, China Legal Science, 2015 (5). 7.The Globalisation, China Rises, and Modernization of Legal System: A Brief Comment, China Legal Science, 2009 (5). 8.The Analysis Tools of the Modernization of Legal System, China Legal Science, 2002 (5). 9.The Deng Xiaoping's Thought of Legal System and the Modernization of Chinese Legal System, China Legal Science, 1995 (1). 10.A Critical Analysis on Hagel's Legal Thoughts, China Legal Science, 1991 (6). 11.A Overview on Marx's Legal Thought, China Legal Science, 1990 (3). 12.The Value of Law and the Right Idea of Social Subject, China Legal Science, 1988 (1). 1.Marx's Legal Philosophy Revolution, Zhejiang People’s Publishing House, 1987. 2.On Marx's Legal Philosophy Thought, Henan People’s Publishing House, 1992. 3.The Legal Philosophy and the Modernization of Legal System, NNU Publishing House, 1998. 4.The Theoretical Logic on the Modernization of Legal System, CUPL Publishing House, 1999. 5.The Historical Logic of Oriental Legal Culture, Legal Publishing House, 2002. 6.The Logic of Right phenomenon, Shandong People’s Publishing House, 2002. 7.The Modernization of Legal System in China, CUPL Publishing House, 2004. 8.The General History of Marxism Legal Thoughts, NNU Publishing House, 2015. 1.The Humanities and Social Sciences Outstanding Achievement Award, Ministry of Education. 2.The Philosophy and Social Sciences Outstanding Achievement Award, Jiangsu Province. 3.The Excellent Educator of Jiangsu Province. 4.First Degree Award on Philosophy and Social Science, Jiangsu Province. 5.The First Ten Outstanding Youth Jurist. 6.National Level Outstanding Contributions Award to Young and Middle-aged Experts. 1.Deputy Director of the Standing Committee of Jiangsu Provincial People's Congress. 2.Director of the Modernization of Legal System Research Center. 3.Chief Specialist of the Institute of Rule-of-law Development of Jiangsu. 4.Vice Chairman of Chinese Jurisprudence Research Association. 5.President of Institute for Chinese Legal Modernization Studies. 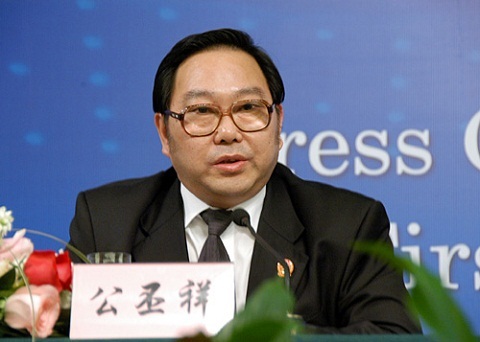 6.Director-General of Jiangsu Collaborative Innovation Center for Development of Regional Rule of Law.